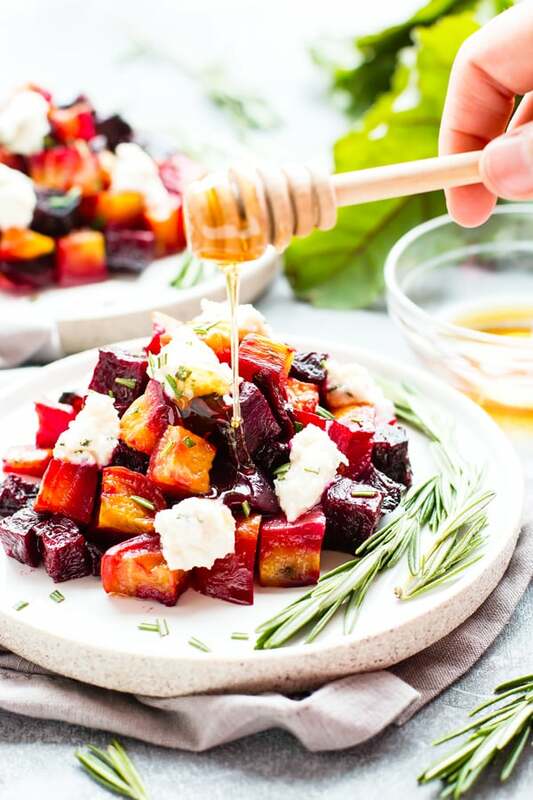 An elegant but super easy side dish, these oven-roasted beets are served with a slightly sweet and tangy honey ricotta and fresh herbs. 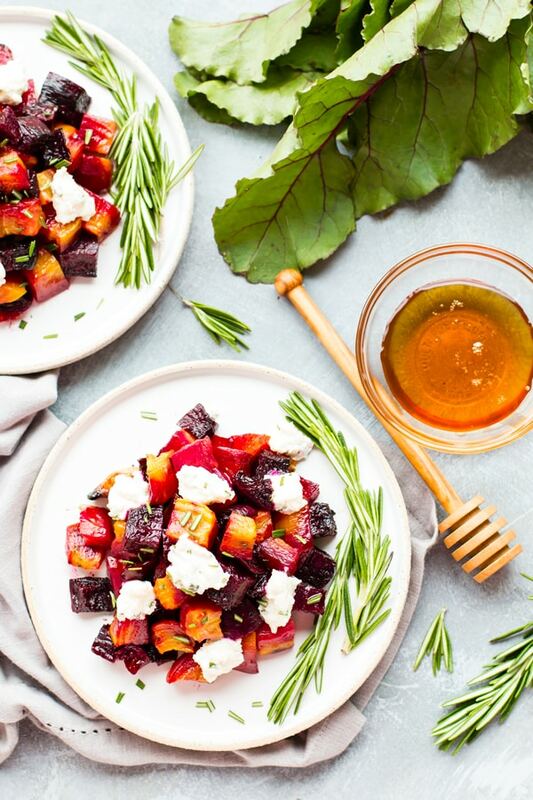 Today I bring to you the most simple, yet incredibly elegant, oven-roasted beets recipe!! A few months ago Cohl and I had the pleasure of enjoying the “special” of the day at a local restaurant. 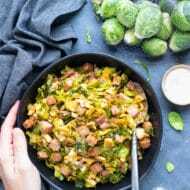 After my taste buds finished doing their happy dance, I set to work trying to concoct a spin-off from that tantalizing pie I could not seem to get off of my mind. After a few failed attempts at stuffing ricotta into figs, I decided to ditch the figs and opt for a much healthier alternative… oven-roasted beets! To be honest, I had NO CLUE beets were so jam-packed with nutrition. Lately, I have been listening to a few different nutrition podcasts and am astounded at how often the podcasters will say beet this, beet that. When it comes to nutrition, the beet just can’t be beaten! <– My corny side couldn’t resist! Beetroots are a great source of fiber, manganese, potassium, magnesium, phosphorus, iron, and vitamin B6. Beetroots contain a special pigment, betacyanin, that helps promote detoxification of the liver and is a powerful cancer-fighting compound. Beets have dietary nitrates that have the potential to lower blood pressure by converting into systemic nitric oxide in the body. Have I convinced you to hop on the oven-roasted beets train, yet?! Trust me, your liver, blood vessels, and body cells will thank you! How Can You Evolve these Oven-Roasted Beets with Honey Ricotta? Don’t have golden beets? Simply substitute 1 pound of regular purple beets. Make your own Homemade Ricotta! 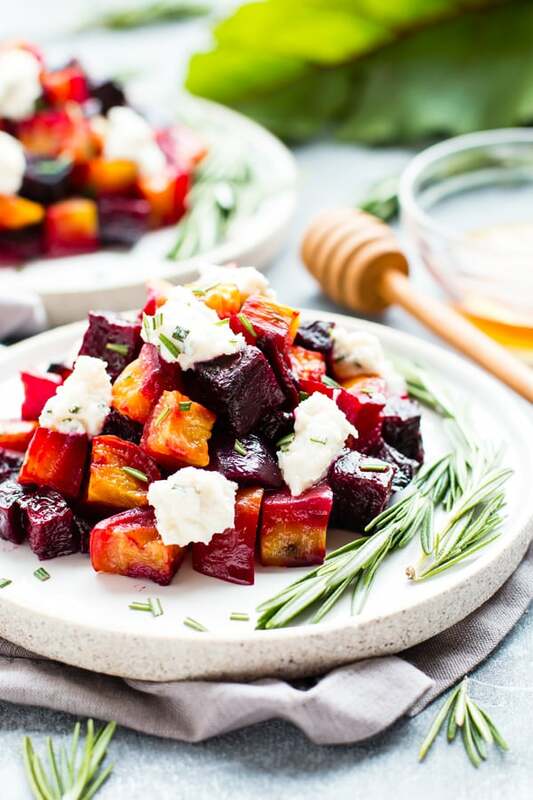 An elegant but super easy side dish, these oven-roasted beets are served with a slightly sweet and tangy honey ricotta and then topped with fresh herbs. Combine beets, olive oil, and ¼ teaspoon salt in a large zip-top bag and toss until beets are completely coated. Place beets on a parchment paper-lined baking sheet and roast for 35-40 minutes, flipping beets halfway through. In a medium-sized bowl combine ricotta, ¼ teaspoon salt, honey, and rosemary. Whisk until combined and refrigerate until ready to use. 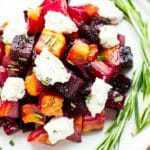 Serve beets warm with honey-ricotta and top with additional rosemary, if desired. Enjoy! 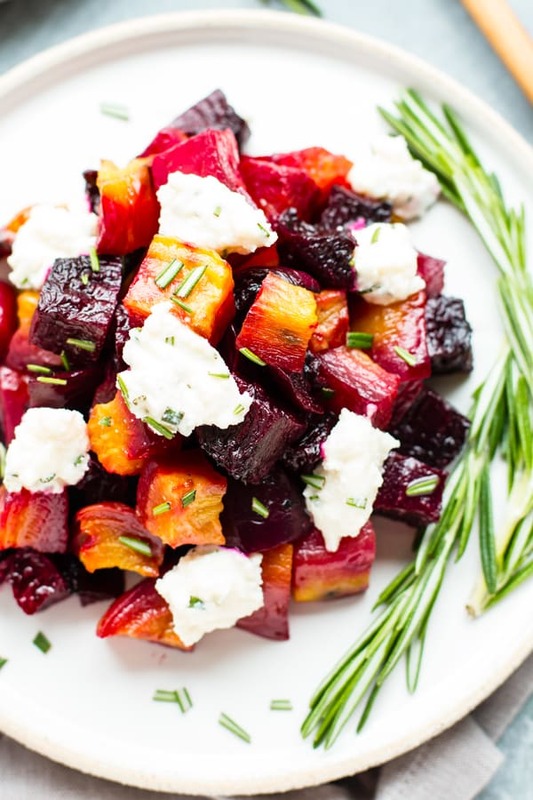 Want more recipes like these Oven-Roasted Beets with Honey Ricotta? LOVED this!! Had some beets I was wondering what to do with, and I’m on a pretty restrictive diet. This was perfect, filling alongside a protein, and DELICIOUS. I added some black pepper to the ricotta, used dried herbs (didn’t have any fresh ????) and I used truffle salt throughout. TO DIE FOR. My husband actually asked if there was more (after I had served up the half recipe between the two of us and it was gone).